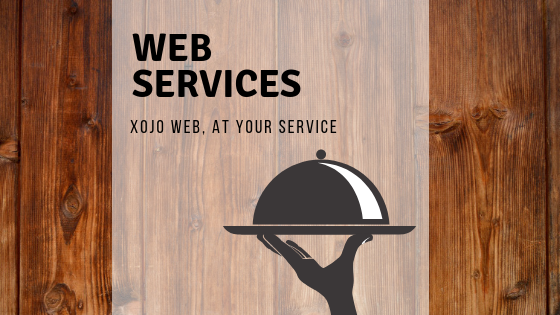 In this two part tutorial you will see how easy it is to create a basic web service using Xojo Web. In the second part, we will create a Desktop client to talk with the web service (you may want to add iOS to the list). Before we start, let me point out that this tutorial leaves out some details related to error checking, validation, data sanitizing and other specifics related to inputs and outputs in order to focus on the central topic. In addition, if you want to follow and reproduce the steps of this tutorial, then you need to download the Chinook Database, named “test.sqlite” in this tutorial. Let’s start creating a web service! Open the Xojo IDE, create a new Web project, and name it WebService. The first thing you’ll notice is that Xojo adds a web page to the project by default – even when our web service does not display a UI. The good part is that you can mix both worlds, adding the webservice part to your regular Web app!. if database.Error then MsgBox "Error connecting to the database"
As you can see, it is pretty much the same code we already use when creating SQLiteDatabase instances in our Desktop apps, linking to our SQLite database file and stablishing the connection so we can operate with the database engine from our app. Xojo Web projects offer two ways to handle the request received. The first is using the HandleURL event. This is the one that fires every time a client app (it may be a Web Browser, desktop or mobile app) connects to the URL associated with the IP address and port combination that is listening for incoming requests. If we were writing a Web App, then this would be the event we would use to attend, process and send the requested web pages, for example. However, for web services we need to add the HandleSpecialURLevent to our project. The main difference is that, in this case, we can use typical URL signatures when its about talk with web APIs, where the methods (i.e, the requested action by the clients or API consumers) is part of the URL itself. The unique consideration is that these URL need to include the word Special or API as part of their URL path. In addition, this is the event that will allow our Web apps to attend and process the callbacks from other external web services, as could be PayPal, for example. Where getCustimers is in this case one of our API methods. As we will see, once the event has been added to a web app, it will receive the Request parameter (a WebRequest data type), waiting from us to send back a Boolean value as response: True to process the request or False (the default value) to ignore the response. Introducing Request, where the information lives! The Request.Path property will return the getCustomers string; so our web service can process it acordingly from this point on. In order to keep this tutorial brief, our web API only has two methods in it: GetAll and AddAlbum. Using the first one, the client app will get the album name in the database wrapped in JSON format. With the second method, our client app will ask the web service to add a new record (a new album) to the right table on our example database. How can we process the request associated data inside the HandleSpecialURL event? Here is where we will find very useful another of the Request object properties. The Entity property includes the sent data as part of the request that are not already present in the headers. Generally speaking, it includes additional data via the PUT and POST verbs. The main point here is that we assign the received data to the data variable (if any), and define a known encoding to them so we won’t get into trouble while processing them afterwards. Of course, our example always expects to receive the additional data in JSON format, so this is why we create a new JSON instance from this data. We use the Select…Case command to decide what method has to execute the web service, and that is based on the component stored in the Path property as you recall. So, if the request uses the GetAll method in the URL, we will call the real method GetAllAlbums in our Xojo code. After processing the information it will return a new JSONItem as the response we will send to the client. How can we send the response to the request? Really simple: calling the Print method on the received request, passing as parameter the text we want to send back. In our example, this is the JSONItem referenced by the Output variable. If we receive a request with the AddAlbum method of our API, then we call the real addNewAlbum method in our Xojo code, passing as parameter the JSONItem object in charge of store the received data from the request (this is the one referenced by the input variable). In fact, the record structure is stored inside the newAlbum root node of the JSONItem. While not rc.EOF // so lets iterate them! item.Value(rc.field("albumid").StringValue) = d // You know you can assign a Dictionary as the value for a JSONItem node. Very useful! As you can see, the code is very simple (and dangerous in a real world app — prepared statements should instead be used! ): it gets the values for the received keys in the JSONitem nodes and uses them as part of the SQL sentence in order to add a new record to the database. A Web service… ready to serve! As you have seen, the code and app structure are really minimal! Of course, this is just a simple example but it gives you a good idea of the kind of possibilities web services offer and how fast you can put it together using Xojo and OOP concepts you already know! Of course, you can run your web app (and services) right from the IDE… what is probably the recommended way to follow this simple example. For other more complex web apps, remember that you can use the one click solution Xojo Cloud and of course any compatible Linux, Windows or Mac server.